We go to the dentist office, and she’s asked who her favorite princess is. At a visit to the pediatrician, the doctor looks in her ear and asks if Cinderella is in there. It’s not that I think princesses or pink are bad, and I know that plenty of little girls love them – there’s a good chance she will one of these days, too. It’s just that my daughter is so much more. 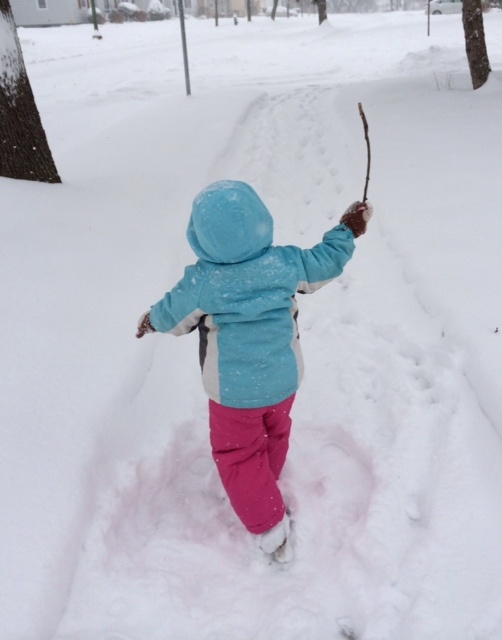 She loves being read to – Madeline, Harold & the Purple Crayon, The Snowy Day, Pete the Cat, Olivia, Lowly Worm. She loves painting and drawing and building tall towers out of blocks and Legos. She loves playing with her dolls, taking care of her “teeny tiny babies” and “cooking” in her play kitchen. She loves dancing, throwing balls, playing train, helping me bake, telling stories, and dancing. But not many people ask her about what she likes. (And believe me, she’d tell them. She has so much to talk about.) They just take a guess -and that guess usually has to do with princesses or Barbie. What message is she hearing? I know that it can be hard and weird to make conversation with a toddler. But I think we can all ask the children around us better questions, boys and girls. When you do, you’ll hear all kinds of awesome things come out of their mouths. Ask them what books they like. What do they like to play with at home? What do they play with at school? What do they like to do in the snow? Have they drawn any pictures lately? What colors did they use? Our children are people, and they all like different things. They have stories to tell, things to share. I would never assume I know what an adult likes just because of their gender – our kids deserve the same respect. This is a great, and very accurate post. I try so hard to expose the boys to everything. I bought them a play kitchen for Christmas and a couple people thought I was crazy – why? They love it. Mason sits on the floor wearing his little oven mitt and stirs his pot. Why is that a bad thing? I’ve also had the same experience that you had at the doctor’s office: “Hmm it looks like there are all girl stickers in there – oh wait, here’s a car!” Drives me crazy. I wish people would see that it’s not 1950 anymore – it’s okay if boys want to play with dolls and it’s okay if girls want to play with trucks. Awesome. As the mother of a now-grown daughter I wrestled with some of the same things. Love your perspective.